Come aboard and become a member of Cuyahoga Valley Scenic Railroad to receive discounts and exclusive member benefits to enjoy a heritage railroad experience year-round. Your membership helps support vibrant, historic alternative transportation through the Cuyahoga Valley National Park. Join at the Stationmaster level for additional behind-thescenes access to CVSR facilities and Fitzwater Train Yard. 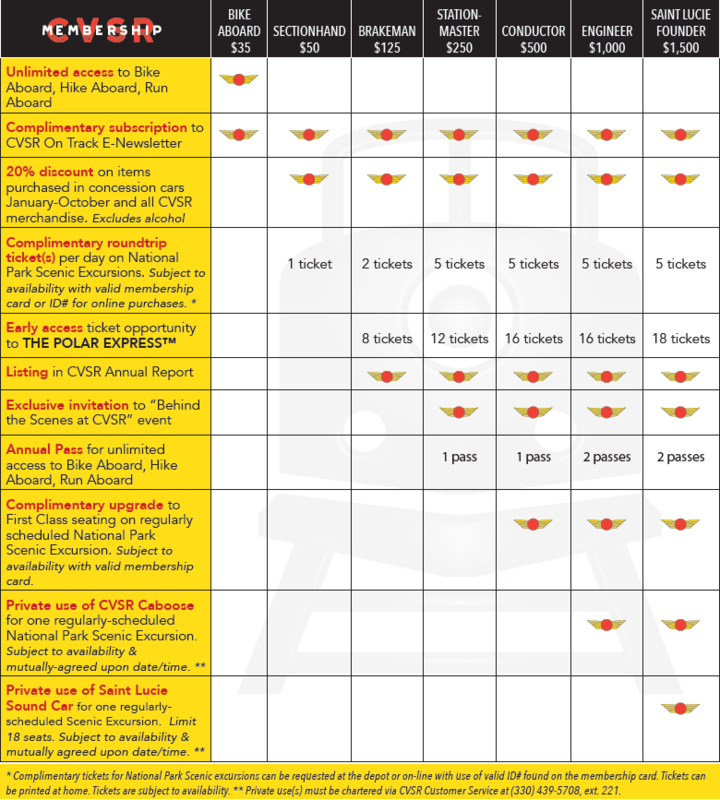 Enjoy special invitations to CVSR events and programs for an even closer view of the CVSR fleet and Cuyahoga Valley. Members at the Brakeman level and above can also enjoy special perks such as early access to our most popular event trains like Dinner on the Train. While you and your family enjoy a wide variety of perks such as discounts and exclusive member offerings, your membership helps support the community by providing education programs for underserved children, encouraging wellness through CVSR’s Bike Aboard, Hike Aboard and Run Aboard programs and being good environmental stewards of the National Park. As the region’s only nonprofit scenic railroad, your generosity helps provide vital support for CVSR’s operations and programming. Cuyahoga Valley Scenic Railroad provides residents and visitors unparalleled opportunity to create memorable experiences traveling the 26 miles on the “iron spine” through the National Park and access to bike, hike or run the Ohio & Erie Canalway. CVSR provides educational programming through its Student Explorer program aimed at school-age children in partnership with the National Park Service and in adherence to Ohio Academic Content Standards. Cuyahoga Valley Scenic Railroad remains committed to preserving the rich history of its vintage railroad cars, improving its fleet to reduce the impact on nature and creating family memories while immersing in the history of Cuyahoga Valley.